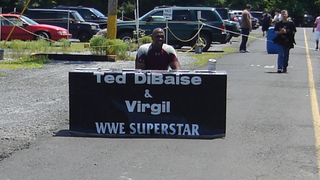 Former professional wrestler and body guard Virgil is fascinating. He first leapt into our hearts with tales of his sad sack routine at Wrestling expos, including this most recent edition of the Virgilbag, where he conned a couple of fans into manning his booth while he took a 45-minute piss. On Saturday night, Virgil found himself in the middle of a Twitter Q&A with fans, including several Deadspin commenters, readers and writers. He wooed Lindsay Lohan, discussed the eau Dibiase and even cut right to the core of philosophy and human nature. It was a lot of fun. Here are some highlights.